One of the things I love about being an electrician is the way technology is constantly developing new products for our home. Clipsal recently introduced the Iconic range of light switches and power points that have revolutionised these basic household items. In this newsletter, I’ll explain what’s possible with a simple power point as well as a couple of tips to keep you safe and warm over winter. 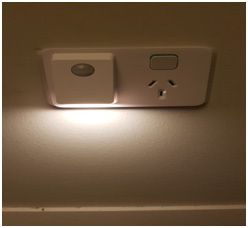 The humble power point is now a lot smarter with the launch of the Clipsal Iconic range. Not only are the sockets thinner and less obtrusive aesthetically, they also come with the option of installing a static night light or a motion-sensor night light. This socket is particularly useful for people who need to get up in the middle of the night to care for young children or family members with health issues. It’s also a great option for low light areas such as walk in pantries and cupboards. The Iconic power points come with interchangeable faces (called skins) so once installed, you don’t need an electrician to convert them into a motion sensor night light. If you no longer need a night light (e.g. your children get older), the switch can be converted back into a double power point. The sensor faces upwards so it will not detect wandering pets and emits a soft light so it doesn’t disturb other members of the household. It uses energy efficient LEDs and automatically turns off after 2 minutes. My youngest daughter loves it! The Clipsal Iconic range includes other innovative products such as USB chargers with a built-in shelf and light switches with the option of Bluetooth operation. For more information on the Iconic range, visit the Clipsal website here. For installation and advice, call us on 0418 442 578 or email info@kuring.com.au. Over winter, there is a big spike in the number of house fires across Australia. These fires are often triggered by using electric heaters incorrectly. So for the safety of you and your family, please take notice of these safety tips. Tip 1: Never plug an electric heater into a power board or double adapter. They are not designed to take the power load and could start a fire. Instead, plug your electric heater directly into a power point. Tip 2: If you must use an extension cord for your portable or fan heater, make sure it is fully unwound to prevent a fire. Tip 3: Surprisingly, your ceiling fan can help to keep your home warmer in winter. You may have noticed a switch on the base above the blades. That converts your ceiling fan from summer to winter mode. Just remember to switch it back once the warmer weather begins.